Spring and summer are the most popular of times of year for home renovation. Before you start demolition, there are a few things you need to do. Check out our list below to help start planning your renovation. 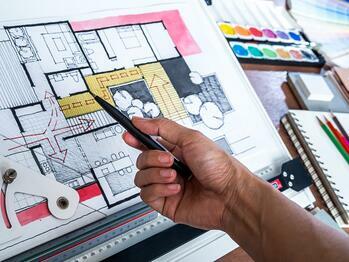 A budget is going to dictate everything that comes along with a renovation project. First, you’ll need to do some research to find out how much on average your type of remodel costs. Second, you’ll need to figure out how much you can realistically spend. Third, you’ll need to price out to contractors and find how much they’ll charge you for the project. Most importantly, any home renovation project you take on, you need to be able to afford it. If the numbers just don’t work with your current everyday budget, hit the pause button and wait until you have the funds saved. Depending on the level of renovation, there’s a good chance your home will be in some sort of chaos until construction is done. After coming up with a design or a list of what you’d like to do, talk with contractors to estimate how long a project will take. If it’s a major project such as the only shower in the home, you’ll need to find alternatives while your shower is out of commission. The old saying ‘hope for the best, plan for the worst’ is key when it comes to remodeling. You need to be ready mentally, emotionally, financially, etc., for anything that may come. Once you start construction, issues you weren’t aware of may come to light. If you have a home improvement project in mind, a home equity line of credit is a great way to get the funds. Similar to a credit card, you borrow money as you need it, using the equity in your home. These loans usually feature lower interest rates compared to traditional loans. If you are interested in learning more about HELOCs, check out our website or contact a home loan advisor at 801-260-7600 ext. 5340.